Get contacts from the visitors of your website. Use active forms and automate the process of getting new contacts. Send auto-responses, create e-mail series which can have up to 150 parts or different automated campaigns on occasions like birthdays or holidays. Send automatic personalized e-mail series with themes and offers, based on answers from your online surveys. Use the direct connection between Quanda and Raynet CRM and get one solution for both marketing and sales without compromise. You will love this solution! More new contacts, more new business opportunities. In our active form designer, you can easily modify the content and the design of your online forms used for collecting new contacts directly from your website. Active forms on your website can jump out, slide out or be fixed in one spot directly on your pages without any programming. They are designed according to your wishes. You can easily link your forms to the auto-responders and e-mail series. Create online surveys. Get anwers. Make better desisions. Online surveys allow you to create, send and analyze even the most complicated online questionnaire or survey. Thanks to the library of questionnaires, you can immediately send out questionnaires of satisfaction to your customers or employees and receive feedback about quality, get information needed for planning company or customer events, and much more. Send better e-mails which your customers will read with interest. In Quanda, you can find everything you need for your e-mail marketing campaigns: Whether this is sending newsletter e-mails on a regular basis, the use of auto-reponses, automatic e-mail series, campaigns with A/B testing, or sending automated e-mails on occasions like birthdays or holidays. Get your work done easier. 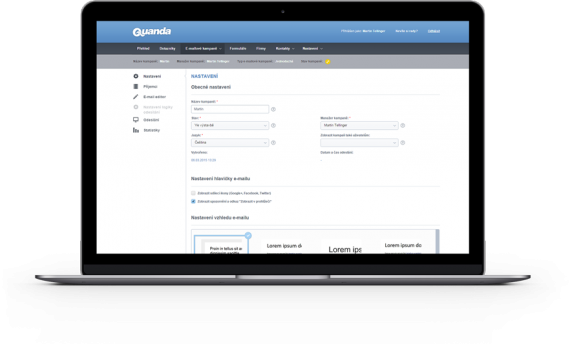 Connect Quanda with your website, e-shop or another system and automate the communitaton.